Tally Hall is not a name you're likely to recognize, but it's one you're likely to appreciate after even a short exposure. Their music is fun, whimsical, and intelligent, and the band is one of the most talented and creative groups you're likely to hear this decade. 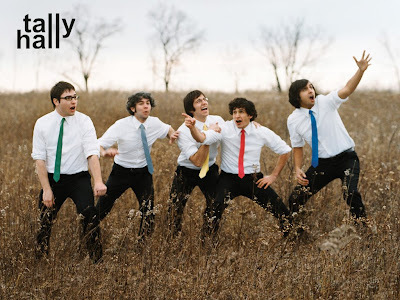 Tally Hall is a male quintet specializing in "wonky rock-and-roll" that sounds like an upbeat mélange of They Might Be Giants, Flight of the Conchords, Fountains of Wayne, that famous "Coconut" song, half of the music released in the 1930s, Eminem, Rent, Blue Jupiter, Moxy Früvous, 8-bit NES music, and the theme to the Mega Man cartoon show... and that's just scratching the surface. The topics of each song aren't quite as eclectic, but there's still a good range of them, with lyrics that go above and beyond simple rhymes and "fa la la"s--whether they're introducing the band, missing a loved one, trying to write a haiku, or encouraging you to eat a banana, Tally Hall never falls into a lyrical or topical rut. Between the blend of genres, the diversity of topics, the fact that no one band member dominates the role of lead singer, each song is wholly unique; it often feels as though Tally Hall becomes another band entirely between songs. Beyond that, it's not uncommon for the musical style to shift several times over the course of a single song. 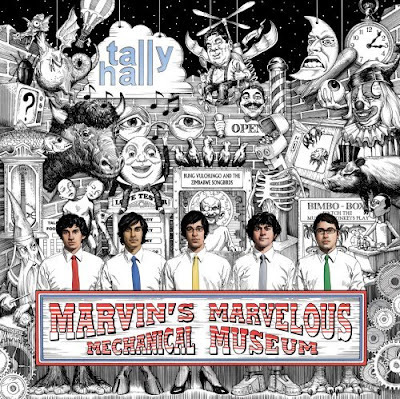 Tally Hall successfully captures the variety and unpredictability of listening to the radio, and this helps to keep their music amazingly fresh, even after listening to them several times. To that point, I like to listen to CDs in the car from time to time, but after I've listened to a CD, it's doubtful that I'll put it in again any sooner than at least two or three weeks, so as not to wear out the songs. Tally Hall was in my CD player for about three weeks straight. Never in history have I listened to anyone or anything for that long, not even my all-time favorite artists. And this CD has some rap on it, which I never listen to. Sure, I listened to the radio from time to time, but when all 18 of my preset stations began to fail me, I came back to Tally Hall, and it was only after about two and a half weeks when I started to skip the few songs I wasn't totally enamored with. Tally Hall isn't my new favorite band, but they sure as heck have impressed me and gotten me hooked. In addition to making music, Tally Hall has an Internet show that's reminiscent of the Flight of the Conchords TV show, but much trippier, and simultaneously a little more mature and a little more juvenile than their music. It's a bit funny, and it's good for people with short attention spans, because, like their music, the show rarely sticks with any one genre or style for too long. They like to throw in their oddball music videos as well, but you can view those individually on Tally Hall's YouTube channel if you're not a fan of their Internet show. And if the music videos are still too weird for ya, just close your eyes and listen solely to the music. Trust me. Tally Hall is a clever bunch of people with immense talent. Their mastery of styles, their tight harmonies, and the sheer variety of their music warrants a listen, especially if you're looking for something different from your usual musical fare. Unless that usual musical fare is already Tally Hall, in which case I can't help you. Check them out at the official Tally Hall website, where you can also learn exactly why they wear those smart-looking color-coded ties.